I recently visited farmers in Limuru, a town outside of Nairobi, Kenya, where I met Angella, a 35-year-old single mother of three school-age children who lost her husband in a car accident seven years ago. For many seasons, Angella planted seed recycled from the previous year’s crop. Her harvest was never large enough to feed her family or generate a surplus she could sell to pay for school fees or medicine. Her one-hectare farm would yield just three 100-kilo bags of maize and two bags of beans each year. But after planting new seeds from a certified dealer—for crop varieties developed to perform well in her local growing conditions—and applying fertilizer, the turn-around was dramatic. On the same piece of land, she harvested 10 bags of maize and four bags of beans. She is now selling her surplus at a local market. Her children are in school, everyone in the family has health insurance, and she’s built a three-bedroom house. With the additional income she makes, she has invested in four cows and 15 goats. When I asked her what prompted the shift to better farm inputs, her answer was simple. Angella said it was now much easier to get better seed and fertilizer from a nearby shop. She used to walk over 18 miles to the Kenya Agricultural and Livestock Research Organization (KALRO) seeking advice about new seeds. But her five trips to KALRO every two months did little to improve her farm. Now there is an agro-dealer store launched by a local entrepreneur less than half a mile away where she shops and consults with the staff about the best seeds to plant and how to apply fertilizer. Imagine the impact on farmers’ yields and on economic development across the African continent if, like Angella, every grower had access to higher-quality seeds and fertilizers. It seems like a straightforward solution. But changing Angella’s fortunes required a series of deliberate policy decisions and interventions. And it’s the lack of such action in many areas that is preventing millions of farmers across Africa from realizing their economic potential. A recent World Bank report on policies that drive economic success on farms found that most governments in Africa are not doing nearly enough. Only a few of the 22 Africa countries in the study scored above 50 on a 100-point scale. So what exactly are the policies that lead to growth? In Angella’s case, her success can be traced to government actions that encouraged seed companies to produce high-quality, professionally certified seeds adapted to local conditions, and to sell them to local markets. For example, the government made it easier for private sector companies to obtain improved crop varieties developed by KALRO. That’s important, because sales-driven private sector companies tend to move much more quickly and efficiently than government-backed organizations when it comes to monitoring farmer demand and preferences, as well as making the seeds they need available. In a related move, the government also encouraged fertilizer companies to register their brands. Registration kicks in oversight activities that can give farmers greater confidence that they are purchasing quality fertilizers, rather than the shoddy and even counterfeit products that sometimes appear on the market. Meanwhile, costly fees that made it hard to operate a small, local agro-dealership were eliminated. And the government directed the Kenya Plant Health Inspectorate Service to intensify inspection work to ensure market liberalization did not lead to a flood of fake seeds and fertilizers. Finally, the government issued special guarantees to support commercial banks that provide low-interest loans to smallholder farmers like Angella to finance seed and fertilizer purchases. What this experience demonstrates is that boosting yields on small farms requires a package of reforms implemented in concert. Angella’s efforts to increase production probably would not have been successful in the many countries in Africa where the majority of smallholder farmers lack access to affordable financing. 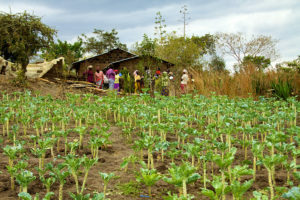 Options like rural micro-finance or privately arranged advances either fail to provide enough money or offer loans at prohibitively high interest rates, which makes farming as a business nearly impossible to sustain. For Africa’s smallholder farmers, policies are often a hidden menace, doing as much damage to production as more obvious challenges like drought. Over the long term, policy hurdles constitute a major factor perpetuating cycles of food insecurity and poverty—and many Africans suffer as a result. Farming in Africa does not need to be a daily struggle for survival. It actually offers a proven path to prosperity. As Angella discovered, even gaining access to fertilizers and seeds can transform a farm into a vibrant, entrepreneurial venture that can change a family’s fortunes. To enable millions of farmers in Africa to send their children to school, buy medicine when they get sick, and buy and grow more nutritious food, we need to confront policy environments that limit their ability to develop their businesses. Agriculture policies should not be designed to deliver benefits to governments through licensing fees and monopolies on items like seeds. They should be working for farmers and local shops instead. Angella’s story is still uncommon in many parts of Africa. We must commit to creating conditions on the continent that make it no longer exceptional to see a young single mother of three find success in farming. Boaz Blackie Keizire is the head of policy and advocacy at the Alliance for a Green Revolution in Africa (AGRA) and a 2017 Aspen Institute New Voices Fellow. 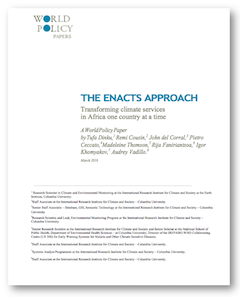 The ENACTS Approach, by Dr.Tufa Dinku and his research team at the International Research Institute for Climate and Society, outlines a new strategy for getting high quality climate data from low resource environments in Africa.